If you have a small oven, you may need additional appliances to cook large meals. Consider using an electric roaster oven. One available brand is the Rival Roaster. This roaster oven fits on a kitchen counter and requires only an electrical outlet to roast large selections of meats and poultry. The Rival Roaster can hold up to 18 quarts, according to Rival. When cooking cuts of meat or whole roasts, use a meat thermometer to ensure food safety. Wash the lid, roasting rack and roasting pan in hot, soapy water before using your roaster for the first time. Rinse and wipe dry with a cloth. Place the roasting pan back in the roaster. Plug the cord into an outlet. Adjust the temperature control dial to the appropriate temperature for your recipe. Allow the roaster to preheat for about 15 to 20 minutes. Place the roasting rack inside the removable pan, if your recipe calls for it, and place your ingredients on the rack. Secure the lid on the roaster. Turn the roaster off with the temperature control dial when your meal is finished cooking. Unplug the roaster before removing the lid. Wear oven mitts to remove the roasting rack with your food. If you did not use the roasting rack, remove the pan with oven mitts. 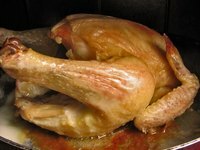 Do You Put Water in the Bottom of a Roaster Oven Before You Cook?